As the human population grows, so does our footprint on the world -- and the smallest actions of the many, even in our own backyard, can have global-scale impact. 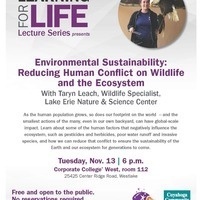 Learn about some of the human factors that negatively influence the ecosystem, such as pesticides and herbicides, poor water runoff and invasive species, and how we can reduce that conflict to ensure the sustainability of the Earth and our ecosystem for generations to come. Must be thanks for the given this amazing post it is the nice way to look here http://fireboywatergirl.me and join free online fireboy and watergirl games. I have decided to do masters in psychology as I always find this subject very interesting and attractive. reading https://assignmentman.co.uk/ article of yours have boosted my experience in the field of psychology.